NEW YORK (WABC) -- Eight of the people who want to be the next New York City Councilmember for the 4th District debated on Tuesday, September 5th. 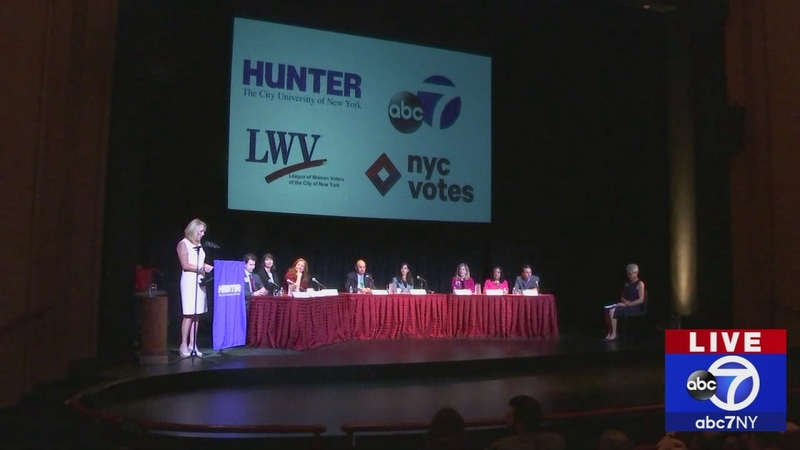 Eyewitness News' Diana Williams moderated the event held by the NYC League of Women Voters. Below is more information from the league, and video on demand of the event. 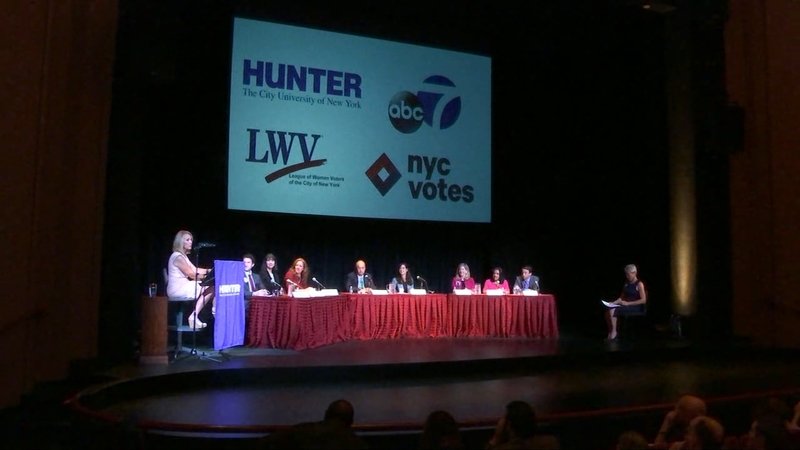 The League of Women Voters of the City of New York partnered with Hunter College, under the auspices of the New York City Campaign Finance Board, to host a primary election debate for an open council seat in New York City Council District 4. 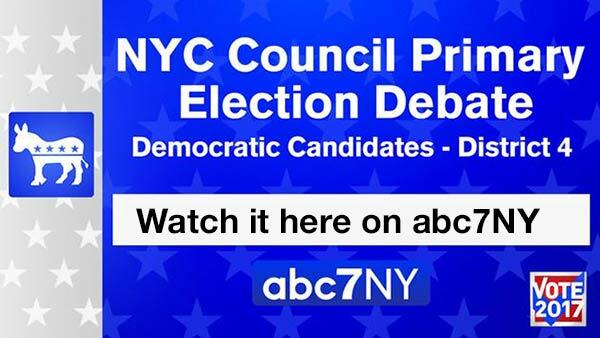 The debate, moderated by WABC-TV news anchor Diana Williams, featured eight of the nine Democratic candidates who are running to replace term-limited Democratic Council Member Daniel Garodnick. The debate was held on Tuesday, September 5th at 7pm at the Hunter College Danny Kaye Playhouse, 695 Park Avenue at 68th Street between Park and Lexington Avenues. You can watch the event on demand below, and hear what they had to say about many topics of interest to city residents. Hear from eight of the people who want to be the next NYC Council member for district four. The candidates include Democrats Jeffrey Mailman, Keith Powers, Bessie Schachter, Marti Speranza, Rachel Honig, Vanessa Aronson, Maria Castro, and Barry Shapiro. Candidate Alec Hartman had to cancel his participation due to his efforts with the hurricane Harvey relief response. "We are thrilled to partner with the League of Women Voters to bring this important primary debate to the Kaye Playhouse at Hunter College," says Jennifer J. Raab, President of Hunter College. "By welcoming students and neighbors to hear from the candidates on the important issues at stake in this New York City Council 4th District race, we advance two strong Hunter traditions: community engagement and the open exchange of ideas." Catherine Gray, co-president of the League, says "The League of Women Voters of the City of New York encourages the informed and active participation of citizens in government. The League is pleased to host a forum where voters can get to know the nine candidates and learn their positions on key issues affecting City Council District Four." "NYC Votes is committed to supporting the League of Women Voters of the City of New York in their work to raise awareness of local election and educate voters," said Onida Coward Mayers, Director of Voter Assistance for the NYC Campaign Finance Board. "When we work together to increase participation in our elections, we build a brighter future for all New Yorkers." About Hunter College: Hunter College, located in the heart of Manhattan, is the largest college in the City University of New York (CUNY) system. Founded in 1870, it is also one of the oldest public colleges in the country and famous for the diversity of its student body, which is as diverse as New York City itself. Most Hunter students are the first in their families to attend college and many go on to top professional and graduate programs, winning Fulbright scholarships, Mellon fellowships, National Institutes of Health grants, and other competitive honors. More than 23,000 students currently attend Hunter, pursuing undergraduate and graduate degrees in more than 170 areas of study. The 1,700 full- and part-time members of Hunter's faculty are unparalleled. They receive prestigious national grants, contribute to the world's leading academic journals, and play major roles in cutting-edge research. They are fighting cancer, formulating public policy, expanding our culture, enhancing technology, and more. About the League of Women Voters of the City of New York: The League of Women Voters is a nonpartisan organization whose purpose is to promote informed and active citizen participation in government. It neither supports nor opposes candidates or political parties Membership is open to all women and men who subscribe to its purposes. The League is supported by membership dues and contributions from public-spirited individuals, businesses and organizations. Be part of the forum! Whether you can attend or not, submit your questions to us at the League website. If you are not in City Council District 4, we will send your questions over to the other organizations holding similar forums in your district.